One of the major tasks that confront people who have been diagnosed with incontinence is finding the right incontinence product. Many incontinence sufferers don’t know what type of incontinence supplies that they will need. Many people assume that they will have to make do with an adult diaper that doesn’t fit or work well. However, while most people are familiar with adult diapers there are other choices, as well. This can lead to all sorts of confusion as people try to navigate their way through the many choices of adult incontinence products. However, after knowing some guidelines you can make the right choice for your incontinence needs. There are different styles of adult diapers-Many people assume that adult diapers only come in the same style as a baby diaper meaning that they go between the legs and have fasteners on the side. While there is this type of adult diaper there are other pull on, belted, and even snap styles. You will not be limited to a certain style of adult diaper. You can choose which style fits your needs the best. There are different sizes of adult diapers-Not to long ago incontinence sufferers had to make due with ill-fitting, unisex, and poorly sized adult diapers. Today, there is a wide variety of sizes when it comes to adult diapers. This is crucial since fit is an important component when it comes to how much protection an adult diaper can offer. The bottom line is that if an adult diaper is too small or to large the wearer is at risk for leakage and accidents. This makes it extremely important to take the time to find the right size for you. There are incontinence products for men and incontinence products for women and this includes adult diapers.-Today, manufacturers of incontinence products understand that men and women have very different needs when it comes to adult diapers. This has lead to the development of adult diapers that address the needs of the wearer by gender. Men will have added protection up front where they need it versus having protection for women where they need it. You don’t have to be stuck using a bulky and awkward adult diaper-The major resistance to using adult diapers is the belief that the wearer will be stuck with a bulky and noisy garment. Today, incontinence sufferers can wear an adult diaper under their normal clothing without fear of “rustling” when they walk. In addition, today’s adult diapers are so slim and streamlined they can be tucked discreetly into a purse or bag and taken on the go. One of the most popular and widely used adult diapers comes from the Surecare protective underwear line. 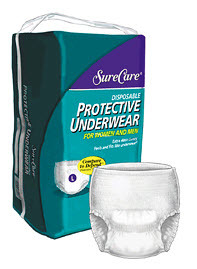 Surecare protective underwear line offers a variety of adult diapers that come in different absorbencies, styles, and sizes. This allows the person with incontinence to choose the adult diaper that works best for them. In addition, Surecare protective underwear also offers a high quality incontinence product for a very affordable price. To see the entire line of products that are mentioned above please click on http://caregiverpartnership.com/landing/surefire/. To find out more about all aspects of incontinence please visit http://caregiverpartnership.com/landing/incontinence. For help and guidance in selecting incontinence products please click http://caregiverpartnership.com/incontinence-product-finder.